A challenging solitaire game that will make your mouse click and your brain crack. Build the eight foundations from the 104 cards, mixed up in ten piles and one more. Two decks, 104 cards, and YOU. This is going to be something! Build the eight foundations in suit from deuces and up, with aces on top, in as few moves as possible or as fast as you can. Press 'i' for instructions while playing. The Pyramid Rapid is a variation of the Pyramid game. You only have 1 minute to remove as many cards from the Pyramid as possible. Pick cards that are one point higher or lower from your base card. Releasing hidden snakes will give you additional bonuses. How many cards can you remove in 1 minute? Here's a cool take on solitaire to help you chill. There will be eight empty spaces at the top of the screen which you will have to fill up with cards. There are thirteen cards of each suit which have to be put in ascending order. Organise the cards into their suits in this highly addictive web game. Build 8 HOME stacks from King to Ace of the same suit. Cards must be stacked in descending order but can be different suits. You can only move multiple cards between stacks if they are of the same suit. Click on a card to pick it up. Move the card with the mouse to a new stack. Click the card to place it on the new stack. If no moves are available click the deck to deal another row of cards. One of the most popular solitaire games returns in a seasonal atmosphere. The rules are the same in spider solitaire Christmas edition. Arrange the cards on the stacks to form full suits from King down to Ace. Full suits of the same color are removed from play. Cards can only be placed on either an empty stack, or on another card that is one higher in value. The suit does not matter, but you can only pick up multiple cards from a stack if they are all of the same suit! Deceptively simple to play - just click the cards that are one above or below the home card - and try to clear the table before the deck runs out! Jokers are wild cards, and they can be played on any cards, so use them wisely. 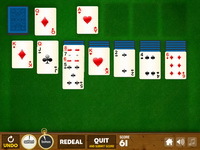 The classic game of klondike solitaire, or patience. Get all the cards to the foundations. Move all 52 cards to the foundations in order from Ace to King. You can move cards on the playing field on top of another card by alternating color if the value is 1 lower. You can also move groups of cards if they have the proper sequence. You can move any card to an open spot on the playing field. Kitty Tripeaks is a classic solitaire variation with bright graphics. While owners are at work the kittens are playing tripeaks. Dedicated to all pet and solitaire lovers! Twenty skill levels and excellent graphics make this game even more exciting. Enjoy summer all the year round playing free online Bahama TriPeaks solitaire game. Travel through eight islands discovering nature. Challenge yourself with 80 levels of stunning solitaires. Great 3D graphic effects, charming sounds and tropical nature will entrance you with full presence effect.